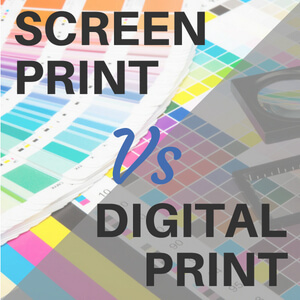 Screen Printing vs Digital Printing – What's the difference? What are the differences & what do they mean for me? Screen printing is a versatile method which uses durable inks, it can print on thick materials and is better suited to large print runs. This method only applies one colour at a time and isn't always suitable for complex graphics. Digital flatbed printing can also print onto various types and thicknesses of materials as well as paper, it can print both small and large print runs and will have a shorter lead time. This print method can produce photographic quality prints. The actual printing processes involved in both of these printing methods also differ quite considerable. Screen printing is a traditional method that is based on the technique of stencilling. A fine mesh is used as the stencil, the ink is then forced through the unblocked areas of the mesh and onto the printing surface. Screen printing only prints one colour at a time, so several screens are required to produce a multicoloured design, but it can use very specialist inks to create innovative print finishes such as Spot UV, Rub Remove (scratch cards) & Scratch & Sniff. Digital printing is a modern printing method that sends the design directly to the printer, this fast set up time is why it has a shorter lead time. Digital printing can include variable information such as names, addresses, serial number, barcodes. Screen printing is better if you need durable print that is used in a harsh environment, you are printing large quantities or if you need an exact colour match / specialist ink. Whereas digital printing is better if you have smaller quantities, you need changeable / variable information on the print or if you need your print urgently.